L: 72" x W: 19.5" x H: 32.5"
Elise 72" TV Console w/ Electric Fireplace Stay in tonight with the Elise 72" TV console with electric fireplace. This piece is styled to fit in with any living room decor. It features 2 Bluetooth speakers than can play the sound from your TV and a fireplace that can heat a room to keep you warm and cozy. Plus, it comes with a remote to control the flame's color, speed and brightness. Stay in tonight with the Elise 72" TV console with electric fireplace. This piece is styled to fit in with any living room decor. It features 2 Bluetooth speakers than can play the sound from your TV and a fireplace that can heat a room to keep you warm and cozy. Plus, it comes with a remote to control the flame's color, speed and brightness. Maximum size: fits most flat-panel TVs up to 80"(guideline only; please make sure to measure your TV's width to ensure it fits). Electric Fireplace with 5,200-BTU heaterOn-demand, 5,200-BTU heater delivers exceptional warmth to rooms up to 1,000 sq. ft. Please be advised that our delivery team is unable to install your TV on the TV console. Warm by the fire ?? So this was out of stock when I purchased this originally in the store. But let me tell you this console is a beauty. I love everything about it from the strong presence it makes to the sound system, to the great colors of the fireplace and how it heats up the area saving you money so you can keepi your thermostat low. The best part is that you can still use the fireplace without turning on the heat, so you can still cuddle on the couch, lol. Nice fireplace w/audio console in 1. Color changes gives a nice added visual effect. Holds my 50 in tv and "cubby" space for remotes, movies, magazines etc. I would definetly recommend this purchase! Tons of features, beautifully crafted, awesome bluetooth, solid speakers, lovely fireplace color cobinations, and heat for the winter! It is expensive but hey you get what you pay for! 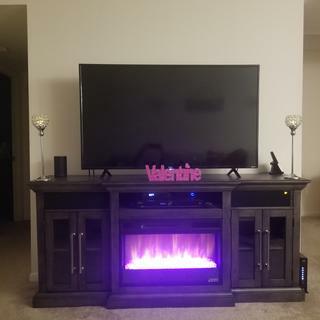 Beautiful piece of furniture which warms our living room and has an awesome blu tooth speaker system and the fire place has various color and patterns! Love it! Beautiful piece! Warms the house! No need for high oil bill. Beautiful piece of furniture, however, you can do without the speakers or install higher quality of speakers. Other than that I'm very happy with it. Best TV console I've ever bought. The speakers have amazing sound quality, the fireplace keeps the room warm, and the furniture is beautifully crafted. This piece is the focal point in my living room. I really can't say enough how happy I am with this piece of furniture. Love the color on this piece, it’s beautiful. The built in speaker on this is loud, which is good. The fire place is beautiful and nice. My two year old just stares at it. This piece is absolutely beautiful and perfect for our space. We couldn't be happier! Would love to see you guys make more pieces in this finish and color. Perfect color. Perfect style. Perfect size. I love how the fireplace changes color. zit is the focal point of my living room. Looks great and sounds great, awesome addition to any room. Heat really fills a small room. I have been looking for a fireplace for a couple of years. I saw this one in the catalog. Went in to see if they had it in the show room. They did. It was the fastest and easiest purchase I ever made. It was delivered two days later. I have gotten a ton of compliments from family and friends. I LOVE IT!!! I am so happy with my decision. If you are considering it, you should get it. We are very happy with our purchase. The console looks perfect and works wonderful. My cat especially enjoys the warmth of the fireplace! Could not be happier with this item. Salesman and delivery men were excellent. I am so very pleased with this purchase. Great piece of furniture and love the fireplace. Works perfectly and receive so many compliments. Beautiful & well built ?? Love this Wonderful Fireplace... Its so Beautiful and it's worth the money! It’s beautiful! I love it and I really love the speakers and the fire place. Hello Deborah, We're very happy to hear you are enjoying your new fireplace console! I have emailed the instructions directly to your personal email. If you have additional product questions, please contact 866.383.4484, option 7. This was such a great buy it looks amazing in our living room plus the convenient of warmth is too good to be true. well made and just the perfect choice and color. I LOVE the tv console. It gives my house a nice classy look. We love it! Great piece of furniture and warms up the whole room. Easy to use and the fire place has cool colors that light up the room. The sound quality is excellent. Great choice and great color of wood. We love everything about this piece. The sound quality is amazing, even better than we expected. The setup for storage and chords is great lots of places to make it hidden and neat. It helps the living room looks so orderly. We are so happy with this purchase. Sunny, we are so happy to know that you love your new console! Thank you for sharing your feedback and for shopping with us. We appreciate it! Beautiful construction and quality. Great sound from the Bluetooth or hooked to the tv. Delivery was quick and the item is AMAZING. Sound system is extremely loud and the heater warms the house up quickly. It is beautiful and we are very happy with our purchase. The staff and delivery team were wonderful as well. It looks amazing and I absolutely love the fireplace and built-in soundbar. Love it, looks good in our living room and the fireplace keeps you cozy. Love it, design and fireplace is awesome,however had trouble connecting my ipad to the Bluetooth! It’s looks amazing, love the different colors of the flames and rocks. The Bluetooth sounds really good and there are hidden holes in the back to hide cables and wires. Well constructed, fireplace is awesome, built in speakers ok. The unit is nice. It is a bit smaller than we thought. Beautiful to look at and fireplace awesome but stereo lacking. Like a stereo from the sixties. Hello Peter, we're very sorry to hear about this experience and would like to look into this for you. Could you e-mail your order details, contact information and a copy of your concerns to rfcare@raymourflanigan.com so we can better assist? Thank you! The fireplace runs too hot for the cable box. The space for the cable box should not be put directly above the fireplace. Can you use the Bluetooth speakers and the speakers on the tv? Or is it one of the other? BEST ANSWER: You can use the Bluetooth speakers and the speakers on the TV. Yes, you can choose either or. If you don't want the surround sound effect, do not turn the speakers on. Can I use the fireplace and the insert Separately? Example: can I put the insert in my bedroom and the fireplace in my living room? BEST ANSWER: Yes. You can use the fireplace insert and the console separately. Can you have the fireplace on without the heating element? BEST ANSWER: Yes you can , heat is It’s controlled by setting temperature on remote , fireplace can be on by itself. Yes. You can have the fireplace on. this fireplace looks very nice however I don't like the speakers it makes it looks old fashion and unnecessary. I was wondering if the maker makes it without the speakers? BEST ANSWER: Hello! Yes, there is a fire log firebox option. I found the question post you are seeing and have updated my answer. I did not realize there was an option until I confirmed with the manufacturer. I apologize for the misinformation. If you would like to purchase the fire log option, it will need to special ordered through your local showroom or by our online sales associates at 866.383.4484, option 2, as this cannot be completed online. Hi Lourdes, I apologize for the delayed response. I reached out to the manufacturer and he found me the same fireplace model without the speakers. You can still order the same crystal firebox or logs insert. This model can be special order by visiting your local showroom, and they can create a custom SKU #. I will send you a personal email with this information! So wait... I CAN get this model with a log fireplace instead of the crystals? On May 7 you said it was not available... Maybe it is no longer available? Thanks. Hello Lourdes, thank you for your interest in the Elise 72" TV Console w/ Electric Fireplace! The speakers do not have to be used in the fireplace. They can be left out but they are automatically included with the purchase. Thanks for your answer. So how is the space covered? And how can I order it without this features? Is this supposed to come with the crystals or are they a separate purchase? Mine did not come with the crystals. Or am I missing something? BEST ANSWER: Hello Diane, we're sorry this has occurred! The crystals should have come with your purchase. For assistance, please contact our customer care department at 866.383.4484, option 7. We will get these to you right away! I called the number you suggested about two weeks ago. I was told they would mail me the crystals but I have not received them yet. Why is the fireplace and heating element turning off and flashing "ES" after I run the heat for only 30 seconds? BEST ANSWER: Hello Samuel, we're sorry for this experience and would like to look into this for you! For assistance, please contact our customer care department at 866.383.4484, option 7. Hi. How can I get the Bluetooth speakers in the fireplace to connect to the TV? The Bluetooth speakers work fine when connected to our iPhones but can only use the TV speakers - OR - the Toslink optical cable for sound. We read the manual carefully, searched many different websites, changed the settings on the Comcast cable box and the settings on the TV itself, but the option to select Bluetooth using the TV sound settings is grayed out. We even moved the Comcast modem to the top of the TV console and followed instructions for pairing, but it never works. The Bluetooth speakers never show up as a device paired to our home network or to the TV. Thanks! BEST ANSWER: Hello Linda! We're sorry for the issues you are experiencing with your new fireplace console. I have replied to you with a direct email. BEST ANSWER: Hello Renee, thank you for your interest in the Elise 72" TV Console. It is only available in the Oak finish, as shown. What is the heating element, infrared quartz? BEST ANSWER: Hello Steve! Thank you for your interest in the Elise 72" TV console with fireplace. The heat flows through the vent that is located at the top of the firebox insert. The crystals are for decor purposes. Does this fireplace TV stand meet Proposition 65 California standards? BEST ANSWER: All of Raymour & Flanigan's furniture meets California standards, including the Proposition 65. Does the console have a back to attach to tv? BEST ANSWER: There is not a piece that is on the back of the console to attach a TV. You are able to set a TV on top of this console or wall mount. BEST ANSWER: The Elise Fireplace does have a wood log firebox option. It will need to be special ordered by our associates either at your local showroom or online sales at 866.383.4484, option 2. The fire insert dimensions are L: 27" x W: 9" x H: 18".The fireplace can be delivered or picked up from the stores! What are the dimensions of the center shelf and side compartments? BEST ANSWER: The dimensions of the center media shelf is L: 26" x H: 4.5". The side compartments are L: 18" x H: 20.5"(There is 10" between the shelves behind cabinet door). Is this fireplace grey in color or Oak?